ISARA (Integrated Solar Array and Reflectarray Antenna) is a US$5.5 million cubesat mission by Richard Hodges, NASA Jet Propulsion Laboratory, Pasadena, California and Pumpkin Inc. of San Francisco. The goal of the ISARA mission is to increase the amount of data that a tiny satellite can transmit by turning its solar array into a reflector for the satellite’s communications antenna. The 3U cubesat is equipped with a large, deployable solar array that doubles as a Ka-band reflectenna providing 100 Mps of data downlink capability. The reflectarray antenna consists of three panels, electrically tied together through hinges, which have an array of printed circuit board patches on them. The size of the patches are adjusted so that the phase of the reflected feed illumination collimates the radiation in much the same way a parabolic dish reflector would. Unlike a parabolic dish, however, the reflectarray panels are flat, which enables them to be folded down against the CubeSat. On the opposite side of the printed reflectarray antenna, solar cells have been added. This makes the overall antenna/solar array panel assembly slightly thicker, but the cells are stowed in the “dead space” between the launch rails that would have otherwise been left empty. This combination of antenna and solar cells makes for a very efficient use of CubeSat volume, leaving plenty of room for payloads such as science instruments or imaging systems. 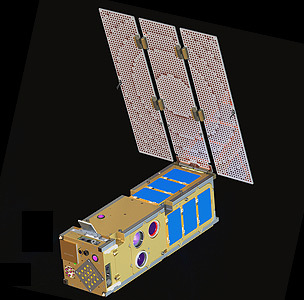 The stowage volume and spacecraft power provided by ISARA technology also enabled the ISARA mission to carry a secondary payload known as the CubeSat Multispectral Observation System (CUMULOS), an experimental Aerospace Corporation remote sensing payload. CUMULOS is composed of a 0.4-0.8 µm visible camera, a 0.9-1.7 µm short-wavelength infrared camera, and an 8.0-13.5 µm long-wavelength infrared, microbolometer camera. The CUMULOS sensors provide a small-aperture, large field-of-view, remote sensing payload suitable for testing the performance of passively-cooled commercial sensors for weather and environmental monitoring missions. CUMULOS is designed for point-and-stare imaging and will allow almost simultaneous 3-band coverage of regions 230 x 180 kilometers (km) in size, at ground sample distances from 180 to 600 meters from an orbital altitude of 600 km. Remote sensing applications to be investigated include: cloud cover detection, surface temperature measurement, hotspot detection (including fires, gas flares, and volcanic activity), and detection of nighttime lights. In February 2013, ISARA was down-selected for a launch opportunity through the NASA ELaNa program. Launch is planned in 2014.